Have you ever wanted to go back in time to be in an old west saloon? Now you can! Well, maybe not going back in time, but with the discounted party goods in this category you can make your Wild West party look as if you and your guests have gone back in time. 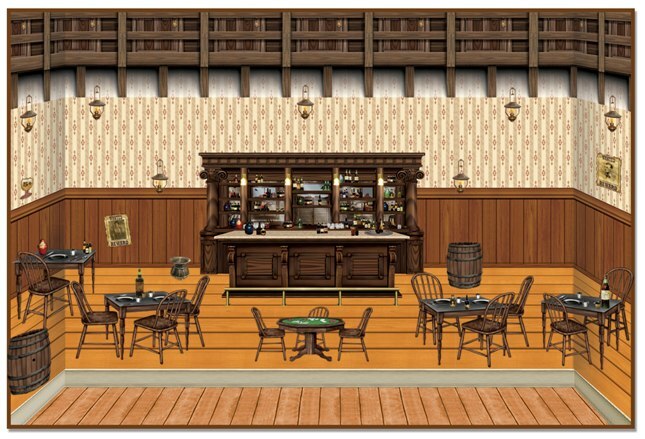 All of the components you need to build this western bar scene are listed above. Simply put up the wallpaper backdrop, combined with the floor/ wainscoting backdrop, and add on the props displayed below. You and your guests will be able to really get into your Wild West personas with the help of all these props. Your guests will want to belly up to the bar and order up a drink with all the options that are shown on the shelves of the Western Bar Prop. Maybe you want to get a poker game going, use the saloon table props to give the bar an open look with plenty of tables for a poker game to start up at. As described before, you can transport you and your guests back in time to the old west when you incorporate our Western Saloon Insta-Themes into your next birthday party or event. Our Western Saloon Insta-Theme is very easy to hang and can be hung in a variety of ways including, but not limited to, thumb tacks, clear tape, staples, or wall putty. Our products vary in size from the smaller saloon cutouts to our backdrops that measure four feet by thirty feet. Regardless of the occasion, PartyCheap has exactly what you need! Our products are made of a very durable material that can be used time and time again if properly taken care of. Make your next birthday party or event one to remember when you instantly transport back in time to the Wild Wild West!